As the fourth pillar of sustainability, the City of Kelowna takes culture seriously and desires to integrate it into all aspects of civic planning and life in Kelowna. To achieve this, Kelowna's first cultural plan (2012-2017) was launched in 2012 to encourage and integrate local culture within all neighbourhoods of Kelowna. Since then, significant progress has been made in implementing 2012-2017 Cultural Plan goals and strategies. Many organizations continue to thrive, and new organizations and venues have emerged. Major initiatives such as the Bernard Avenue revitalization, the Civic Block Plan, the relocation of the RCMP, completion of new parkades and the Okanagan Centre for Innovation have had an impact on the landscape of the Cultural District. Affordability for spaces for living, working and creating is an issue for many artists. In addition, key buildings in the City's inventory of cultural infrastructure such as the Kelowna Community Theatre and the Okanagan Heritage Museum continue to age, with mounting structural deficits, as new buildings go up around them. An update to the Cultural Plan is intended to respond to these changes and challenges and set a direction for the next five years. While the City realizes that as an organization it does not create culture, operating as a municipal government our role is to facilitate and promote culture by providing vision, goals and adopting strong policies. An update to the Cultural Plan is intended to respond to changes and challenges and set a direction for the next five years. Over the next year, we'll be working to update the Cultural Plan, and we want you to be involved! 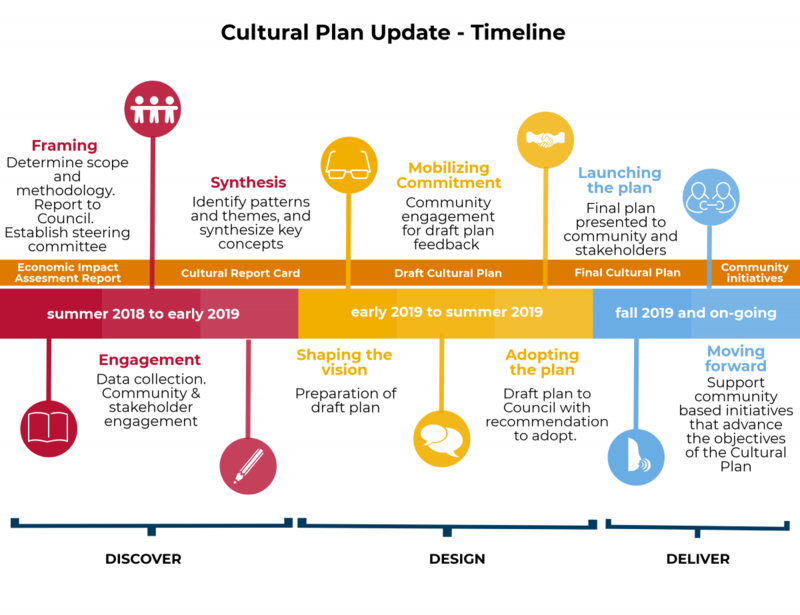 We are seeking your input on the Cultural Plan's current goals, and how you prioritize them - and if you think there is anything missing from the goals. We also want to hear your ideas for strategies on how to work towards the goals - what can residents, organizations or the City do. Review the goals and their definitions, fill out the survey and post your ideas on strategies to help generate discussion. We're also inviting you to Host Your Own Engagement session. Scroll down to learn more. From July 16 to September 3, we were seeking your feedback to influence the Cultural Plan's vision. Survey responses helped us develop an understanding of the community's idea of culture, and what it means to them. Review the Report to Council to learn more about the Cultural Plan engagement process. We invite individuals, organizations, businesses and collectives of diverse histories and practices to play an active part in the process of shaping the 2020-2025 Cultural Plan by “Hosting Your Own Engagement” event with your staff, board, volunteers, members or the general public. The grant application process is now closed, but you can still use the Conversation Toolkit to have your own event, and submit the feedback to culture@kelowna.ca by 4 p.m. on Mar. 31.The conversation you host can drill down into a topic of vital importance with a small group of people, or it can be broad, involving a larger group of people brought together to generate conversation. The choice is yours! Host Date & Time Location Target Discussion Get Involved! Central Okanagan Heritage Society March 14, 6pm-8pm Reid Hall, Benvoulin Church History and heritage lovers Held as a part of Heritage Week. Held as a part of the Kelowna Fan Experience. Check it out on Facebook. Thank you to every host for putting on an engagement event as a part of the update of the Cultural Plan! Feedback collected from these events will be used in the development of the strategies of the 2020-2025 Cultural Plan. If you need some guidance on completing your Final Report, check out our Host Your Own Final Report Template. Please note it is not mandatory to use this form to complete your Final Report. On October 31, 2011 council reviewed the plan and directed staff to move forward with non-monetary recommendations and return with recommendations from the plan during annual budget deliberations and as needs and opportunities arose. As part of the update to the Cultural Plan, we'll also be creating a Cultural Report Card to assess the 2012-2017 Cultural Plan progress. You can view the Cultural Plan mid-term report to learn about progress made from 2012 to 2015. Cultural development in Kelowna began in the early 1970's when a committee formed to study the possibilities of developing a 'Cultural Arts Centre' in Kelowna. In 1989, a Mayor's Task Force was established to create our first cultural policy. Updated most recently in 2010, this policy gives form, support and provides direction for the cultural development in the city. Over the past 20 years, significant progress has been made to integrate arts and culture into overall community planning and deliver cultural services to residents and visitors. Early work led to the establishment of a number of cultural facilities, the Cultural District, a granting process, and the establishment of a Cultural Services branch in 2001.